Soul Kitchen belongs to the new generation of hostels, it features ensuite private rooms, custom bunk beds with curtains for privacy and cool design. It’s perfect solo travelers, couples and families. To help you to get around, we've got free maps, our staff will help you find activities for your interests, as well as recommend hidden treasures, we can also help you with booking your train ticket. After you check out you can leave your luggage with us for the day, free of charge. We offer tourist voucher and invitation for your russian visa and by the way, you can stay in St Petersburg without visa when you revel with a ferry, check out our website for more info. Kids under 2 years can stay for free (we provide a baby cot and a child chair). D’une propreté impeccable, le staff est super sympa, les soirées ils proposes des repas à thème pourquoi créer une belle alchimie! Ordinateurs, imprimante, café gratuit etc beaucoup de chose disponible facilement. Les lits sont confortables, les chambres bien et accueillante. Bref un moment super, pour l’instant la plus belle, propre et sympa auberge de jeunesse que j’ai visitée. L’emplxement est aussi parfaite. Merci à tout le staff! Truly the best hostel I have ever been to. I would recommend 1000%. Heaven on earth. Much love to the team! Perfect place, amazing staff, beautiful rooms, very clean, big kitchen... Best hostel ever !!! Excellent accueil ! Pleins de petits détails pour faciliter la vie des oiseaux migrateurs et favoriser les contacts. Un rêve d'hôtel ! Si l'on ne devait retenir qu'une auberge de jeunesse à St-Pétersbourg, c'est bien celle-ci. N'hésitez pas et foncez! Our New Year party there was fantastic ! We had so much fun and we met really cool people overthere ! Soul Kitchen is like home, you feel good and everything is perfect inside. I recommend of course ! Well located, clean, amazing atmosphere and staff. 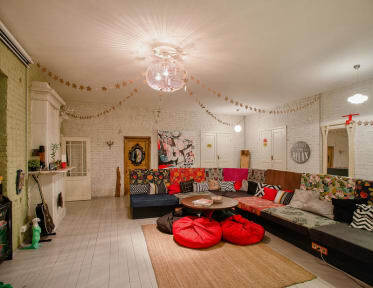 I highly recommand this hostel!